Access to clean water is of paramount importance for ensuring necessary levels of sanitation and health. According to the World Health Organization over 844 million people lack even a basic drinking-water service, including 159 million people who are dependent on surface water. Contaminated water can transmit diseases such diarrhea, cholera, dysentery, typhoid, and polio. By 2025, the WHO estimates half of the world’s population will be living in water-stressed areas. Disease prevention and economic development require, apart from electric energy, access to clean ground water supplies. 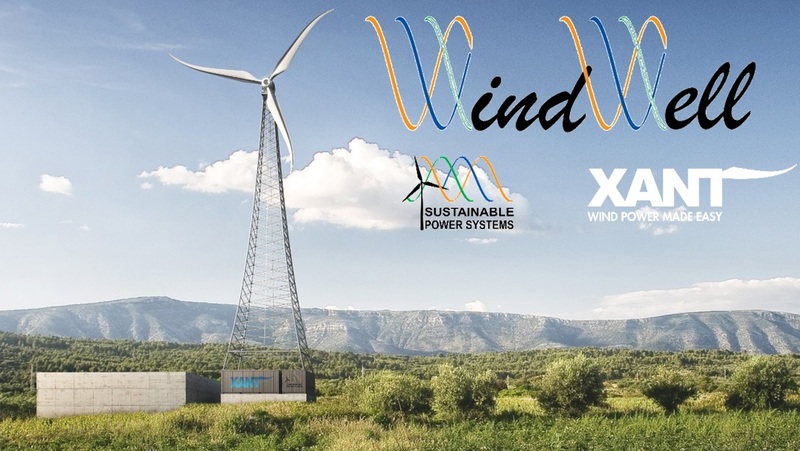 XANT and Sustainable Power Systems combine their expertise to bring you the WindWell, the solution to the energy-water-nexus: access to ground water requires pumping, pumping requires energy. Wind power and water pumping are a match made in heaven. The storage of the pumped water allows decoupling of the water demand from the wind power production. Pumped water is an energy storage medium, and a cheaper one than electric batteries at the same capacity. In addition, a simple concrete or prefab storage tank last much longer and can be built/supplied locally. Water production depends on the well depth, tank elevation, riser pipe diameter, the pump characteristics and the annual energy yield of the turbine. Sustainable Power Systems have developed the engineering tools to quickly dimension the optimal system configuration (installed wind capacity, storage tank capacity, pump size) based on the water demand, wind speed distribution and well depth. When replacing diesel-powered pumping, a correct sizing can eliminate all fuel consumption. The WindWell uses a DC-bus architecture thereby reducing the CAPEX by eliminating 2 power converters and transformers. This reduced complexity not only significantly lowers the cost, but also makes for a more efficient system due to fewer conversion steps and reduced losses during low-wind periods. Finally, the simplicity of the DC-bus architecture leads to a higher reliability. Water pumping and desalination are ideal application for renewable energy. Sustainable Power Systems and XANT have developed a pre-engineered wind-powered water-pumping solution for off-grid irrigation and municipal water supply applications. The power system’s innovative architecture provides low-cost and complexity and high efficiency and reliability. Many off-grid sites possess excellent wind and solar resources, allowing renewable electric generation at from $0.05 to 0.20/kWh, depending on location and system size. Adding wind turbines or solar arrays to existing diesel power systems can yield dramatic fuel savings, with a corresponding reduction in net cost of energy. However, adding a large amount of renewable energy capacity to isolated power systems represents a significant technical challenge. Individual power system components (diesel generators, wind turbines, photo voltaic inverters, etc.) are generally not designed to work together in harmony. Their operation must be carefully coordinated to achieve reliable electricity supply, power system dynamic stability, and maximum fuel savings. Sustainable Power Systems has developed a full suite of modular and flexible power components and control systems that integrate and manage power generation from different sources: wind, solar, and diesel. Sustainable Power Systems is primarily a technology provider. We leverage our technical abilities by working with various regional project developers and service organizations around the world to design, construct, and support renewable hybrid power systems that will provide maximum value to the end user for many years to come.